The exterior of your house is exposed to weather and traffic every day. As a result it accumulates dirt, grime, mould, bacteria and other contaminants. 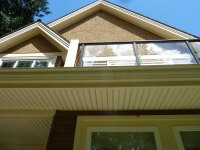 They are harmful and lead to deterioration of siding, gutters, window frames and other surfaces. A professional house wash removes these harmful contaminants and extends the lifespan of your house exterior. 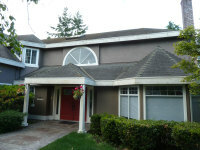 Our house washing service does not damage the exterior surfaces of your house. We use softwash no pressure that kills the mould, bacteria and moss and gently removes all the dirt and build up. If you are looking for a professional cleaning service to treat your house siding, soffits, gutters, roof, windows and window frames, skylight, patio, deck, driveway or more, we can help!